Wondrous, weird, and sweetly innocent, Ponyo is a tale bursting with love, which is recommendation enough for the young and the young at heart. 101 min. Walt Disney Pictures, Buena Vista Pictures Distribution. Directors: Hayao Miyazaki, John Lasseter, Brad Lewis. Cast: Cate Blanchett, Yuria Nara, Hiroki Doi, Noah Cyrus, Matt Damon. How often does a kids’ film come along that has a good chance of making your kid a better little person? Ponyo—the new work from master Japanese animator Hayao Miyazaki (Spirited Away)—is just such a film. Wondrous, weird, and sweetly innocent, Ponyo is a tale bursting with love, which is recommendation enough for the young and the young at heart. The love is partly Miyazaki’s for his craft, but also part and parcel of a story that’s a hybrid of Hans Christian Andersen’s The Little Mermaid and the Disney version of Pinocchio. Thanks to Miyazaki superfan John Lasseter of Pixar, Ponyo is getting its domestic distribution from Disney, in a dubbed version (purists will no doubt find the subtitled version on the inevitable home video). The story concerns the fish-y offspring of the androgynous undersea wizard Fujimoto (Liam Neeson), a gruff and absent-minded professor who can’t understand his daughter’s defiance. The daughter, Brunnhilde, is one of a school of curious and seemingly identical fish with humanoid faces and finless bodies that look like red nightgowns. When Brunnhilde escapes on an adventure of exploration, she washes up by the cliff-side home of five-year-old Sosuke (Frankie Jonas, the “bonus Jonas” younger brother of you know who), who promptly adopts her and names her Ponyo (Noah Cyrus, younger sister of Miley). Ponyo immediately takes to the loving Sosuke and life above sea level: she wants to be a real girl. In a classic allegorical moment, the wizard barks at Ponyo, “Revert! Don’t change!” but the toothpaste can’t and won’t go back in the tube. Sprouting limbs, Ponyo makes headway as a human, but there’s a serious problem. The magical creature isn’t where she belongs, and as a consequence, the world has been thrown out of balance. 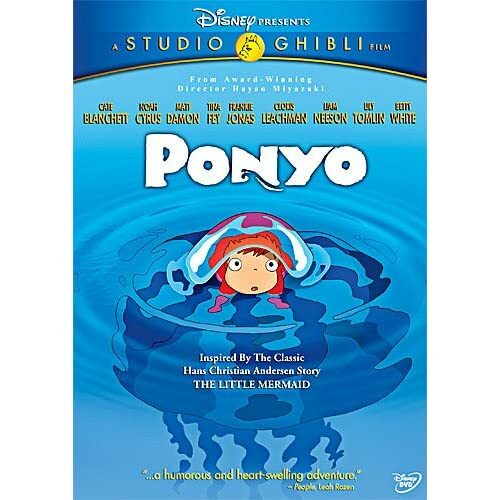 Ponyo must either return home, or—according to the fish’s mother, goddess of mercy Gran Mamare (Cate Blanchett)—Sosuke must pass a test proving the depth of his love for Ponyo. Though Sosuke’s father (Matt Damon) is more even-tempered and accepting than Fujimoto, Miyazaki overtly compares Gran Mamare to the boy’s stormy but loving mother Lisa (Tina Fey); both advise, “Be calm” (the notion of playing Lisa’s reckless driving for laughs may have been lost in translation, though). Miyazaki’s free-spirited creativity—which delights in the impossible—infuses every aspect of the storytelling: the animators put oodles of personality into the characters’ body language and the character of the living ocean itself; Studio Ghibli’s finely crafted analog 2D pastel animation has never been more welcome. Miyazaki’s favored theme of environmental responsibility is woven into the fabric of Ponyo, its underwater wonderlands threatened by filth and garbage. Taken to its logical conclusion, Sosuke’s idea that he can simply take Ponyo from the ocean probably shouldn’t be rewarded, but it does at least come with an environmental disaster that demands correction. Ponyo is quite funny (especially in the fish-girl’s obsession with ham) and charmingly adventurous (including a jaunt in a toy boat): another great achievement from Miyazaki. Ponyo looks bright and beautiful on Blu-ray in a perfect hi-def video transfer. Sharply detailed and colorful, the image captures every nuance of Miyazaki's artistry. Happily for Miyazaki fans, Disney includes both the English dub (in DTS-HD Master Audio 5.1) and the original Japanese mix (in Dolby Digital 5.1). It's a shame that the original audio doesn't get the deluxe treatment, but even purists will agree that the English dub is thoughtfully written and ably performed. The Blu-ray + DVD edition includes options to watch the film with "Disc Introduction - Meet Ponyo" (3:22, HD) or with Original Japanese Storyboards. The introduction includes comments from executive producers Frank Marshall and Kathleen Kennedy, as well as behind-the-scenes footage. The World of Ghibli consists of two sections. The larger Behind the Studio section kicks off with the lovely "A Conversation with Hayao Miyazaki & John Lasseter" (3:33, HD) and continues to the featurettes "Creating Ponyo" (3:58, HD), "Ponyo & Fujimoto" (2:59, HD), "The Nursery" (2:00, HD), "Producer's Perspective: Telling the Story" (2:28, HD), "Scoring Miyazaki" (7:19, HD), which include interviews with Miyazaki, producer Toshio Suzuki, and composer Joe Hisaishi. "The Locations of Ponyo" (9:35, HD) is an excerpt from Japanese documentary The Scenery in Ghibli. Also here are "Original Theatrical Trailers" (3:22, HD) and "Behind the Microphone: The Voices of Ponyo" (6:04, HD), which includes comments from Kennedy, Marshall, Betty White, Tina Fey, Liam Neeson, Frankie Jonas, and Noah Cyrus. Other Ghibli Worlds Preview offers the Miyazaki interview pieces "My Neighbor Totoro: Creating My Neighbor Totoro" (3:00, HD), "Kiki's Delivery Service: Creating Kiki's Delivery Service" (2:28, HD) and "Castle in the Sky: Character Sketches" (2:41, HD). The second part of the Special Features is Enter the Lands, an interactive map that offers access to the worlds of My Neighbor Totoro, Kiki's Delivery Service, and Castle in the Sky. clickable settings and characters lead to brief explanatory featurettes with narration and film footage. This is a gorgeous film that the wee ones will love, and adults will likewise find it one of the most exciting animated titles available on Blu-ray. All site content © 2000-2019 Peter Canavese. Page generated at 04/26/2019 03:34:32AM.